Imagine for a moment that all vessels operating in the Baltic Sea, as well as the national vessel traffic service (VTS) and search and rescue (SAR) centers, had a common system where they could exchange different types of information concerning maritime safety, security and the sea environment. ESABALT is a research and development (R&D) project studying the feasibility of a novel system for enhancing maritime safety. The name ESABALT is an acronym for “Enhanced Situational Awareness to Improve Maritime Safety in the Baltic.” Thus, the project focuses on the Baltic Sea as a testbed for the system concept. 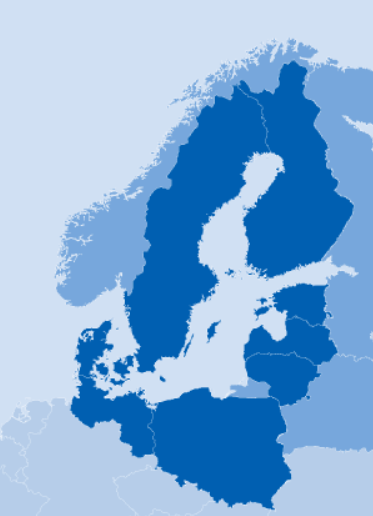 Funding is provided by the Joint Baltic Sea Research and Development Programme (BONUS) together with partner countries Finland, Sweden, and Poland. The partners in the ESABALT consortium include the Finnish Geospatial Research Institute, Furuno Finland Oy, SSPA, and Maritime University of Szczecin. The term situational awareness refers to the abstract concept of being aware of one’s current or developing situation. In the maritime context, a vessel’s crew must maintain good situational awareness in order to safely and efficiently operate the vessel. This includes awareness about the environment (e.g. developing weather conditions), the maritime traffic surrounding the ship, and the condition of one’s own vessel and crew. Especially in the case of an emergency, situational awareness may also include information about the condition of other ships, such as a damaged ship whose navigational ability has been jeopardized. In a general sense, situational awareness encompasses any information that can potentially have an effect on the crew’s objectives, namely safe and efficient navigation of one’s own vessel. ESABALT aims to increase the safety of all vessels operating in the Baltic Sea by providing tools and services which enhance situational awareness. This is achieved using the latest technological advances in sensing, positioning, e-Navigation, Earth observation systems, and multi-channel cooperative communications. In addition, ESABALT aims to facilitate crowdsourcing of relevant information from a multitude of users. That is, by reporting information to a central repository, all end-users will be able to achieve a greater level of situational awareness than they would by acting independently. A guiding tenet of the ESABALT concept is that all maritime users in the Baltic Sea can operate more safely by collaboratively building and maintaining situational awareness. The various elements of this concept are depicted in the figure. 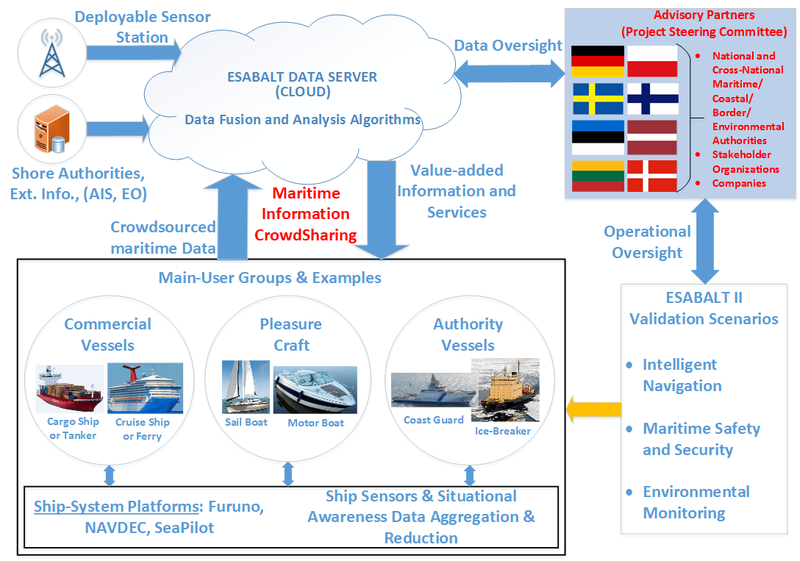 Figure: ESABALT integrates relevant maritime technologies through a dedicated situational awareness server, providing innovative services to end-users and stakeholders in the Baltic Sea region. The ESABALT data server is the central module which holds all the crowdsourced data from the individual ESABALT terminals. The terminals are onboard ships, which may include pleasure craft, commercial vessels and authorities vessels. The onboard terminals are the primary interface to the ESABALT system. 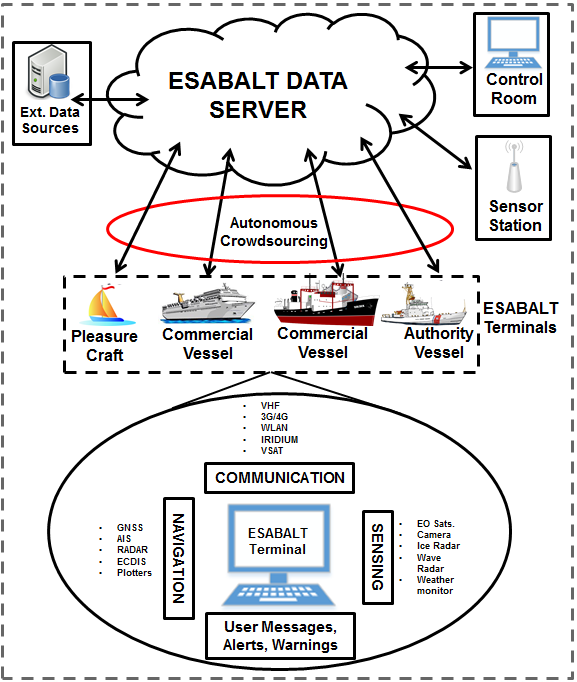 The users of the terminals are allowed access to the various services and functionalities of ESABALT, including the crowdsourced data from other terminals/ships, reports on ice, pollution and weather conditions, information about nearby ships, and ability to report their own information to the data server. The operation of the terminals is supported by the three primary technology pillars of the ESABALT system – Navigation, Sensing and Communication. The constituent technologies under each pillar are shown alongside. The control room hosts the administrators who maintain the ESABALT system and ensure its reliable and continued availability to the users. The sensor stations may be land-based or sea-based and contribute to the information provided by users about the environment around the Baltic Sea. Figure: ESABALT System Architecture – 1. Figure: ESABALT System Architecture – 2.